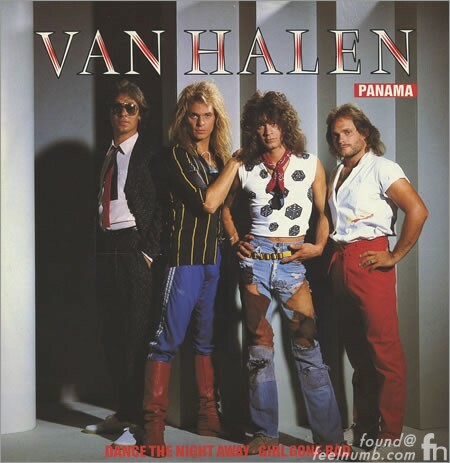 The song “Panama” was released on June 18, 1984 as the third single from the Van Halen 1984 album. To this day, it is one of Van Halen’s most recognized songs. The loud roar that follows is not a guitar it’s actually Eddie Van Halen revving the engine of his 1972 Lamborghini Miura S. The car was actually backed up to the studio and microphones were attached to the exhaust pipe to record the sound. Today on May 19, 2016 a friend of mine from high school ran into EVH in Sherman Oaks, California and he happened to be driving the rare 1972 Lambo!!! This is why I love living in Los Angeles. Thanks Matt for taking the photo and letting me use it. 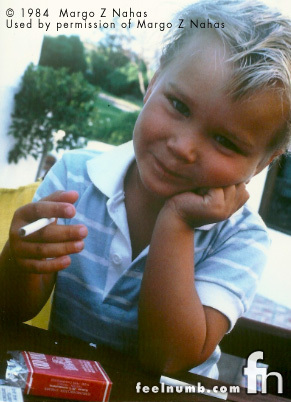 A few years ago Margo Z. Nahas, the artist that painted famous Van Halen “1984” album cover sent me this exclusive photo she used as the basis for her painting of the little blue-eyed angel/devil/cherub boy with wings and a pack of smokes. Click on the photo or link below for the details. Why Is Beastie Boys Ad-Rock Wearing A Happy Halloween Shirt?? ?